My thanks to Grouphunt for providing me this Hobonichi A6 leather cover for review. 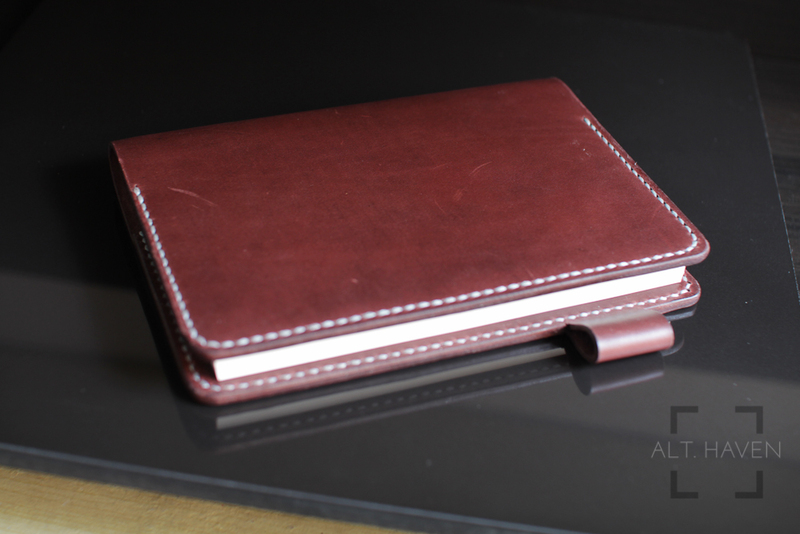 This leather cover is made to hold an A6 size Hobonichi. It is made by The WY’s Den, a local couple making bespoke leather goods. Sadly, I didn’t have a Hobonichi A6 around to try out the leather cover but never fear another A6 notebook to the rescue! I have a Apica CD A6 notebook that fits the leather cover perfectly. It does take a little work to get my notebook inside mainly because my notebook’s cover is made to be roll or bend. The leather cover is a chocolate like colour with silver-grey threads as stitched along the front and back. The edges are nicely burnished. The 100% full grain cowhide feels soft and very smooth to the touch. There isn’t any imperfection to the touch on the leather. It is soft and supple. Most importantly, it is able to lay flat easily. The leather doesn’t scar easily even after 3 weeks of daily use. However that’s not to say that it doesn’t pick up any scratches. Leather like any other natural material will age and get scuffed up as you use them and that’s part of its natural beauty. The leather cover also comes with a pen loop. I am not sure if the intent was to clip the pen onto the loop or have the pen be inside the loop. Regardless, the pen loop is only wide enough to hold very slim pens such as the Lamy CP 1, even my Pilot Metropolitan doesn’t fit inside the loop. I would prefer if the pen loop is wider to accommodate more of my pens but that’s just a nitpick really. 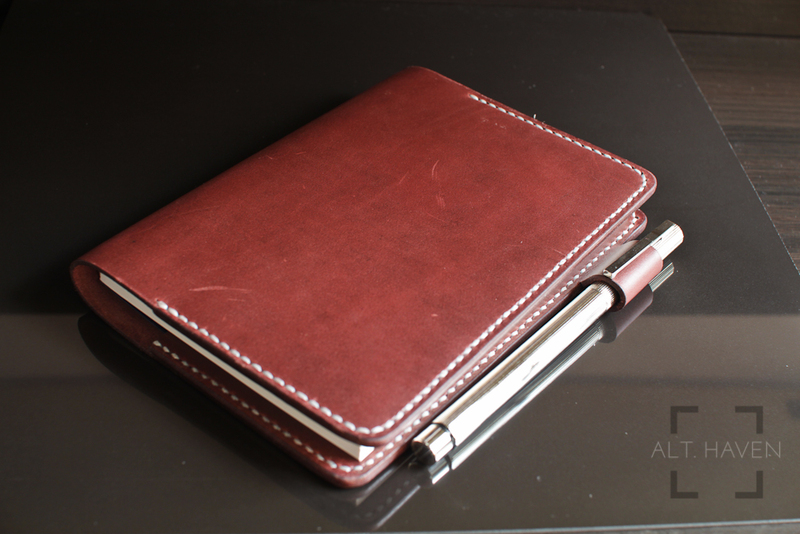 The leather cover itself isn’t overly thick so it doesn’t bulk up the notebook once you insert it in. However one thing to note, I notice sometimes when I close the notebook after use, the leather cover seems to be grabbing onto the cover. Maybe it is due to friction between the cardboard and leather or something else totally. It takes a very deliberate push to close the notebook fully. It’s not a major issue but it is somewhat of an annoyance. 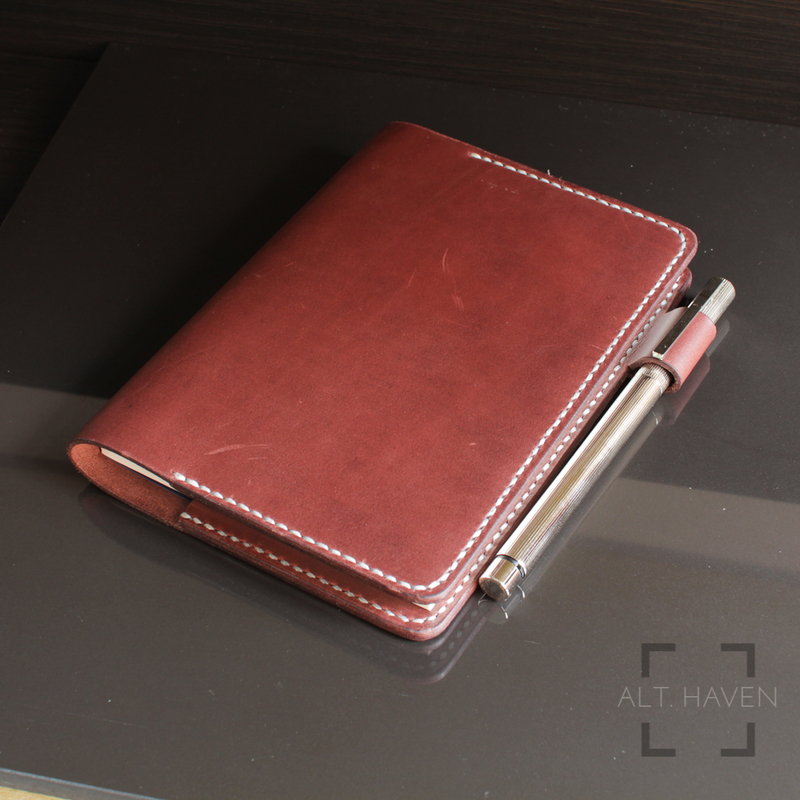 This leather notebook cover will be retailing at $65 on Grouphunt. At that price, it is quite reasonable especially considering it is made of very nice leather. You are also not limited to only using a Hobonichi notebook with this leather cover too. I know many people have purchased a Hobonichi when the hunt was on last year, if you are one of them, check out this leather cover here. I will be giving away this particular leather cover that I reviewed. All you have to do is follow the instructions below to have a chance to win this leather cover. This giveaway is open to people residing in Singapore. My thanks once again to Grouphunt for providing the leather cover for review and sponsoring this giveaway.